Trying to find my way, in art as well as in life. The image is a good metaphor for where I am right now, in search of what to do, how to do it and where to go. After I posted a picture of this mandala on instagram I journaled a bit in my diary. Then I totally went into writing mood, and before opening up my laptop I also wrote all around and on top of my doodled compass mandala! I have been journaling a lot this month, in yes, a new notebook. A blank notebook with a very pink cover. Love it, and I will post more about it later. What I really need right now is to clear up my studio space and my desk! I can not think straight when it is this messy, but it will have to wait until later this upcoming week. My recent trip to IKEA didn’t help, because they didn’t have all the parts for the shelf system I wanted (Ivar). And also I am on writing deadline for an article that needs to be finished next week. Wish me luck. I plan to have another day of writing tomorrow – though not as much journaling as today but probably another blog post squeezed in. You know me, I can not keep away! Oh Hanna, you silly silly girl! You don’t need a shelf to pick up your stuff from the floor, and if you can’t pick one journal and stick with it, why do you even bother to journal? One doodle in that new notebook, and then what? Will you just take that pile of notebooks and store them away! Just do your work instead. You’re such a pro procrastinator! All excuses too. Hanna, you know what? I think you should just give it up, all together. Stop trying to create order. Stop trying to clear the clutter, throw all that material away and you’ll be free… The more creative you try to be the more chaos you create! Yada-yada right? At least I hope so. What does your inner critic tell you about hording material? Or anything? You can enter to win Quinn’s new book in my book review post, she has a lot of ideas on how to find counterparts for your IC’s negativity. If you too are in need of a compass, maybe pointing you toward inspiration, I think you should check out one of my favorite blogs, it is what inspired my compass mandala. Watch the video Compass Mandala here! 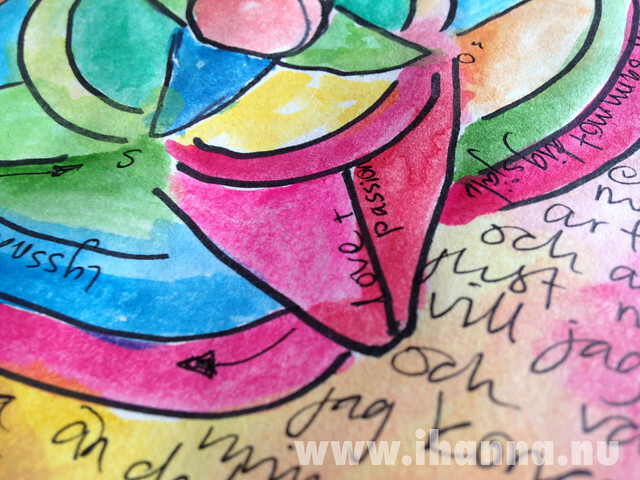 This entry was posted in Notebooks, On writing and tagged inner critic, journaling, mandala. Bookmark the permalink. I feel what you’re feeling when it comes to hoarding and chaos and the need for Ikea storage and good ideas to tidy the studio and still I know exactly where everything is….well nearly. I admit I get some surprises when I do tidy and instantly I fall in love again with the new found loss and the mess is getting upon me even worse…..”sigh”! Man, we share the same IC! So often I think, now why do I have all this stuff? What use is it? I never use it, don’t use it the right way, not good enough … well, you know the drill. I love repurposing things (example bubble wrap for stamping, etc). I get such a thrill from it. But opening up the drawers where I stash stuff can really do a number on my attitude. But when I do use something or force myself to just reach in and use whatever comes out? I love it! 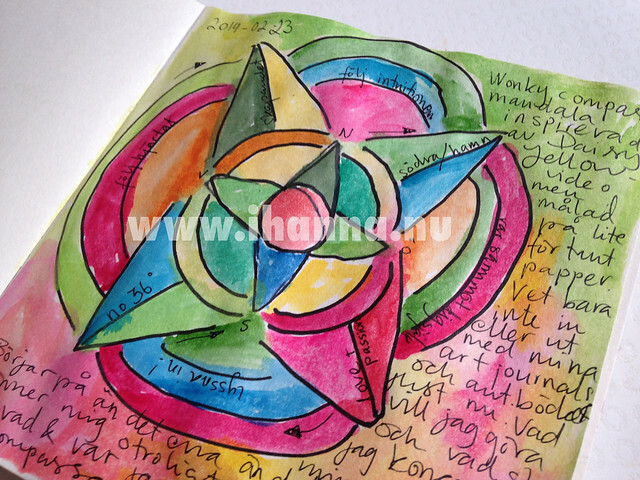 Hanna, I adore your compass mandala! So very happy that you created a compass of your very own. I wish you sweet travels.